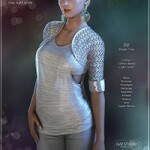 DAZ Iray – Summer Prints – merchant resource, that can be used to create your Free/Commercial projects. Summer fabric prints for your seasonal renders. You will get 50 high quality prints 1200 x 1200, saved as .png files format to keep best quality possible. Materials saved with 4 different fabric settings: silk, cotton and semi-transparent sheer cotton and silk fabrics.